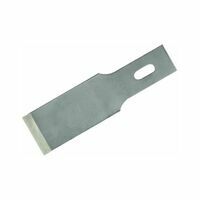 TechniEdge Knife Blade, Deburring, Hobby, Series: TE01, Suitable For Use With: NO 2 Series Handles, NO 24, 0.025 in Thickness, Applicable Materials: Plastic, Wood, Linoleum, Rubber and Foam, High Grade Premium Steel, For Deburring, Stripping and Gasket Cutting, Straight, Heavy Duty Cuts Five blades made of finest cutlery steel. 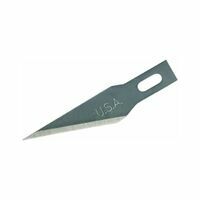 Fits Sheffield 12116, (460.0748) and all midget utility knives. Micro carbide dispersed metal delivers up to 3X longer life than standard carbon blades; precision grind process removes the burr from cutting edge for cleaner cuts; optimized grind angles deliver improved sharpness for less repeat cuts. Made in the USA. 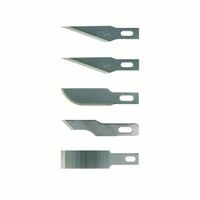 TechniEdge Blade set, 5 Pieces, Includes: (2) NO 11, (1) NO 10, NO 16, NO 17 Blades, Suitable For Use With: NO 1 Series Hobby Handles Heavy duty blades fits most utility knives. Five .025" thick blades. High carbon steel. Fits all standard breakaway or snap-off 13 point, 9mm knives. 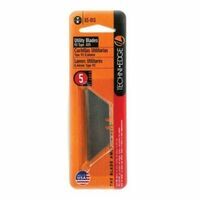 Three 2-7/16" x .024" blades; edge is engineered to easily cut abrasive material such as drywall, ceiling tile, wallboard. S3 Technology double hardens the blade edge for increased cutting life. Drywall callout is laser etched on blade to prevent mixing with standard blades High carbon knife steel blades; 8 point snap off; fits all standard 18 mm, heavy duty snap-off knives. Blades are Bi-Metal technology with a high speed steel cutting edge that stays sharp longer. Fits most standard utility knives and are flexible to last longer.